If the foot is, or the feet are, beside the hips, this becomes a good internal rotation of the hip. Any sharp or burning pain here, you must come out! There are several options for coming into this pose. Start with simply sitting on the heels and notice how this feels. If there’s pain in the knees, skip this one. If your ankles are complaining, try a blanket under them or skip the pose. Lean back on your hands, creating a little arch to the lower back. Check in with how this feels. This may be it for you today! If you can go further, come down onto your elbows. If this is too deep for the lower back, do the Sphinx pose. You can also straighten one leg for Half Saddle. You can bend the straight leg and place the foot on the floor (note pictures). A deep variation is to hug the top knee toward the chest. That can get quite juicy. If you can only go as far back as your elbows, rest on a bolster to relax here. There are various ways you may use bolsters-stack two crossways under the shoulders, or use just one, or place one lengthwise under the spine. Resting the top of the head on the floor opens the throat. Arms overhead can open the shoulders and intensifythestretch in the hip flexors. Lift the hips even higher by placing a block between the feet and under the buttocks. A blanket or rolled up towel under the ankles can relieve pressure there. Sarah Powers often adds a twist in the Saddle by bringing a hand behind the back and grabbing the inner thigh, which stimulates the shoulder lines. In this version, you won’t lean back onto the head or the elbows; from sitting, just arch back and remember to do both sides! Play with sitting on the heels and between the heels; the first emphasizes the lumbar more, and the second works the quads and hip flexors more. There are several ways to end this pose. If you can, come back up the way you went down, propping yourself up on your elbows and then onto the hands. Lie down on your belly, straightening your legs slowly to allow the knees to release. If that doesn’t work and you are stuck, rent a crane or a forklift. If they are not available, trying rolling to one side and slowly straighten the opposite leg. Before rolling onto your back, you may want to wait a bit or hold your sacrum with your free hand and ease down to your back. If you’re flexible, you can just lift your knees up and pop your feet out. After coming out, lie quietly on your back for a few breaths with the legs straight, tightening and releasing the kneecaps. When you are ready, hug the backs of the thighs and pull the knees to the chest to release the lower back. Child’s Pose: move into it slowly. You may need to rest your head on your palms before coming into a full Child’s Pose. Crocodile or Push-up engage the knees and tone the core of the body. If you came out and are lying on your back, try Hinge: while lying on your back, raise and lower the legs; knees bent is easiest, straight legs is harder. To support the back, place your hands, with palms down, under your buttocks. If your arms are overhead, you will also work the Heart and Lung meridians. This is not a deep backbend for experienced yogis who are already very open in the lower back; however, this pose does work many areas at once: ankles, knees, quadriceps, hip flexors, sacrum and lumbar, and shoulders. If your job requires you to stand all day and you do this pose at night before bed, your legs will feel rested in the morning. 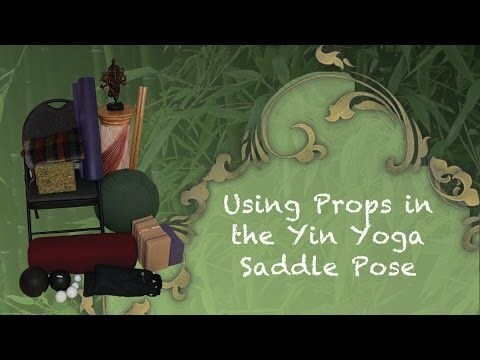 Unlike the yang poses, don’t tuck the tailbone as we normally would in backbends.